Girl next door or street chic diva? 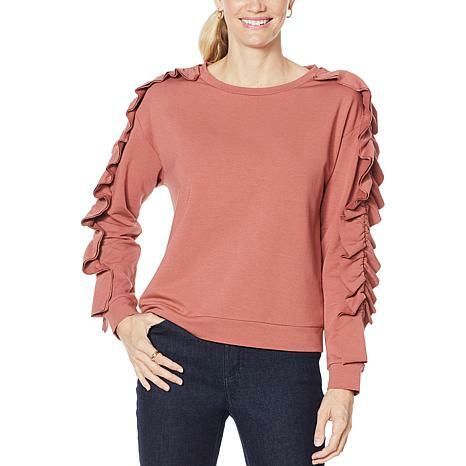 Dress this statement-sleeve sweatshirt up or down and let those marvelous ruffle-trim sleeves charm attention your way. I purchased all three colors. I am 5 2 125 lbs. and bought XS. Perfect fit and roomy. I love unusual sweatshirts and this one is a show stopper! I received Lots of compliments. So feminine! Sized down..from 1X to XL.. sleeves are fun and best of all...its a beautiful sweatshirt..thanks G.
Love this top. Bought the dusty aqua and was so pleased with the look and quality I had to come back and purchase the pink as well. Fit is great- I'm 5'5" 116 lbs, 32" bust and the xs fits perfectly. I am such a fan of this line and have purchased countless pieces and will continue to do so. G by Giuliana did it, again! I love my sweatshirt. I wore it for the first time and received many compliments. I will order another..
Copper Fit French Terry Raglan-Sleeve Sweatshirt Don't sweat it. Copper Fit garments are made with copper ion-infused fabric that's anti-odor and moisture wicking to help you stay dry and comfortable. Perfect for warming up and cooling down before and after a workout.